Ryanair passengers may face more disruption as further strikes by Irish-based and German pilots could be on the way next month. The Irish Air Line Pilots' Association (Ialpa) is set to announce rolling stoppages beyond a third 24-hour strike on Tuesday following no breakthrough at talks. And the result of a ballot of Germany pilots by the Vereinigung Cockpit union is due on July 31 following failed talks - which could mean rolling stoppages in August. Massive disruption is already expected next week as up to 100,000 passengers will be hit by 600 flight cancellations at major European bases. Flights to and from Belgium, Portugal and Spain will be grounded on Wednesday and Thursday as unions demand "fair" pay, an end to agency work and contracts that recognise local law. However, despite being asked Ryanair has not responded to a request for clarification as to whether there are Irish flights among the cancellations. A spokesperson for Ryanair confirmed that: "Over 90pc of Ryanair's 50,000 customers whose flights on July 25 and 26 were cancelled due to a strike by some cabin crew in Belgium, Portugal and Spain, have now been reaccommodated on alternative flights, or applied for full refunds." Up to 4,000 passengers' travel plans were disrupted yesterday when 24 flights were grounded as Irish-based pilots held a second strike in a dispute over terms and conditions. Up to 16 flights will be cancelled during a third stoppage by the directly employed pilots next week, hitting another 2,500 passengers. 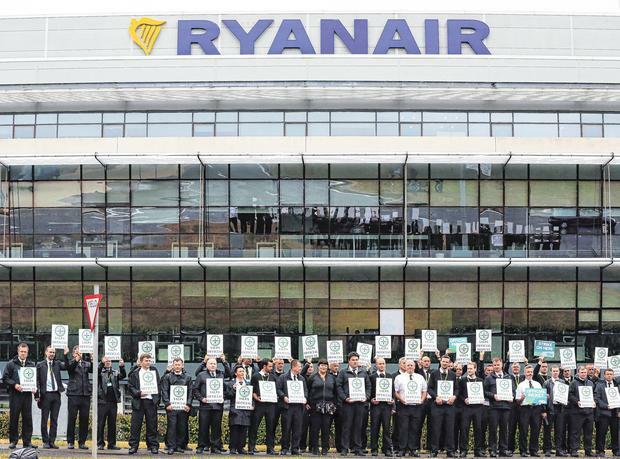 The pilots mounted pickets at the airline's headquarters at Airside in Dublin yesterday. "They've brought it to the company's door," said trade union Fórsa spokesperson Niall Shanahan. He said he expected Ialpa to contact the airline to continue talks. "When we met the company on Wednesday at no time did the scheduled industrial actions come up for discussion," he said. "Our reading of that was that the company accepted that these actions were due to go ahead. "Clearly, they've been able to rearrange operationally in order to minimise disruption. It was 30 flights last week, it's 24 today, it's 16 next Tuesday. "Nevertheless, in terms of the effectiveness of industrial action, clearly that comes at some logistical and financial cost to the company." The pilots want a seniority system that would give those with longest service first call on promotions, holidays and base transfers. In a letter to Fórsa yesterday, Ryanair's chief people officer Eddie Wilson described the strike as "pointless". He said the airline had signed two "recognition" agreements with cabin crew unions in Germany and Italy since Wednesday. During that same two-day period, he said Fórsa has done nothing except hold another "pointless strike".